Following recent news of a seemingly imminent iPad 3 launch, it appears Amazon may have some news of its own. According Pacific Crest analyst Chad Bartley, the jungle-themed sales giant may be planning to roll out new 7 and 9 inch successors to the Kindle Fire. Pacific Crest analyst Chad Bartley this week raised his Fire sales estimate for this very reason. "We are raising our 2012 sales forecasts to 14.9 million from 12.7 million," he wrote. "But we believe there is an upward bias, particularly from the new 7- and 9-inch models, which we expect to launch in mid-2012." There have long been rumors of an 8.9 inch Kindle Fire variant. However, there are few details other than boldly chosen words shown above. Such a device may not even carry the "Kindle Fire" brand name or even the tablet's unique budget value, so accurate predictions are unlikely at best. If Bartley's information is correct -- and that's probably a big if -- consumers who originally shunned the 7 inch tablet for its diminutive screen may be lining up this summer in order to purchase its larger counterpart. Creating a larger tablet should increase the Kindle Fire's appeal across a wider audience. As we mentioned a few months ago, the iSuppli determined that Amazon was selling the Kindle Fire at a small loss. Despite selling the device for less than it costs to manufacture, analysts have recently estimated that each Kindle Fire sold will generate $136 in profit throughout their lives, on average. The extra revenue for Amazon comes from the sale of apps, games, books, music, movies and more. 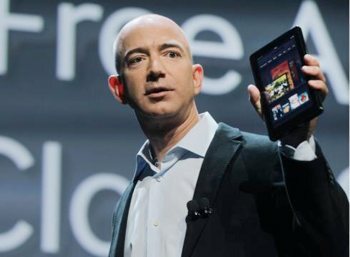 Originally, Amazon's choice of a 7 inch screen was cited as an effort to keep production costs as low as possible. Fast forward to the future (ie. now) where LCDs are progressively becoming larger and cheaper, it is understandable why Amazon may see this year as the right time to introduce a 9 inch variant.